Full Home Renovations | Sarnia, Strathroy and Petrolia | Carosyl Home Additions Inc.
Are you thinking about completely renovating your Sarnia home? Whether you recently purchased an outdated home in Sarnia or are looking to finally upgrade the home you’ve always lived in, a home renovation yields many benefits. A home renovation can enhance aesthetics, improve functionality, and increase the resale value of your home. If you have a growing family, a complete home renovation is especially beneficial. A room addition or a floor plan rearrangement can give you the additional space you need to live comfortably. Save yourself the hassle of moving into a new home, and stay right where you are with a home renovation! 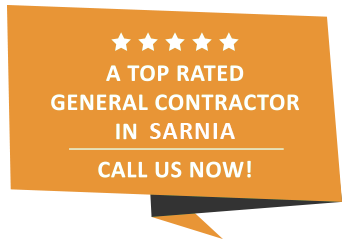 Are you looking for Sarnia home renovation services? Here atCarosyl Home Additions Inc., we can evaluate your needs and provide you with suggestions on lighting, sound insulation, materials, and finishes. If you need help in the aesthetics department, an interior designer can point you in the right direction. They will be able to help you decide on colours, trim, furniture, window coverings, and more! Ask us for additional information! Deciding to fully reconstruct the aesthetic and interior detail of your Sarnia home may sound daunting at first, but when you think about it, you’ll end up saving money in the long run. In fact, our professionals will ensure that those finishing touches are long lasting. Working with us is an investment. Carosyl Home Additions Inc.s reputation for delivering breath taking finished results, superior project management and honest, fixed pricing is what sets us apart from the rest. Don’t entrust the value of your home to just any kitchen and bathroom remodeling contractor. We have the experience to completely transform your home for the better. With our excellent supplier relationships, we can offer you unbeatable customer service and pricing. We’ll ensure you’re completely satisfied, excited and looking forward to the beautiful results of our quality craftsmanship, every step of the way. Reach out to book a free, no-obligation consultation today. Put our proven total home renovation and project management skills to work making your remodeling dreams come true, stress-free. Our innovative, highly recommended, and accredited design team have years of experience listening to our customers. We put our vast product knowledge and highly sought after design skills to good use, mapping out an actionable, total home renovation plan that aligns with your vision and budget. Material and new appliance selection is our speciality. Let our home designers answer any questions you have about our vast selection of quality brand products, we’ll make sure you get the high-quality finishes and details you envisioned without breaking the bank. Budgeting for a full home renovation in Sarnia doesn’t have to be a guessing game. Careful cost planning and informed preparation go a long way. Especially when it comes to keeping material, labour and unexpected costs down on any given project. Let us take the confusion, hassle and stress out of applying for permits and the calculation of material and labour costs. Our team always ensures that all safety standards and procedures are followed. Sarnia building code, regulations and permit requirements can sometimes set budgets back if you are not properly prepared in terms of the appropriate paperwork. Carosyl Home Additions Inc. can assist you in obtaining the required permits to guarantee that additional costs are not incurred. Our value driven pricing and commitment to up-front cost transparency give our clients the confidence they need to make their dreams come true. Connect with us via telephone or email to book an appointment for a comprehensive free estimate. Carosyl Home Additions Inc. installation technicians, contractors, and designers take great pride in our workmanship. Diligent surface preparation, detailed, confirmed plans and resource management logistics all play large roles in how we deliver the final product. We are so confident in our ability to get it right, we guarantee our work, so you can breathe easy knowing your home is in capable, professional hands. Book an Appointment for a Free Consultation with Sarnia’s Trusted Full Home Renovation Contractors Explore and unlock the possibilities a full home renovation holds to your Sarnia home. We can save you money and get that home renovation of yours completed on time without exceeding your budget. Let’s talk home improvement ideas! AtCarosyl Home Additions Inc., we are fully insured and ready to fulfill your home improvement needs. Give us a call if you want to talk about the home renovation ideas for your Sarnia property. We are looking forward to hearing from you!